GarGhee spread is generated from the Golden Ghee's home chopped garlic and parsley. It has familiar taste of Trieste sauce, but never experienced in this configuration. We have added five herbs and some salt to the spread. 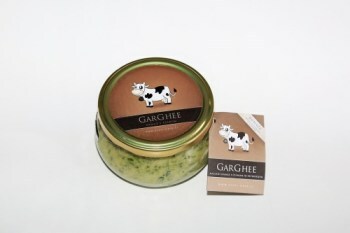 GarGhee is an ECO/BIO spread made from Golden Ghee, chopped garlic and parsley. 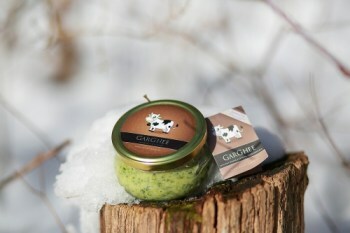 For many it is the known taste of parsley and garlic sauce, yet never savoured in such combination. Five different herbs and salt are added to the spread. The symphony of joint information and tastes thus becomes hedonistic, widely used and revitalizing for the whole body. Garlic and its wide spectrum of activity are attributed more than 200 biologically active substances, the most important among them being allicin and ethereal oil. The historian Pliny the Elder advises garlic consumption as a remedy for 61 different unwelcome physical conditions. Among other, garlic contains potassium, calcium, phosphorus, selenium, great amounts of vitamins B and C as well as proteins. 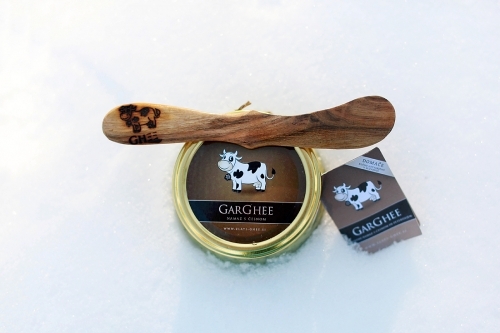 GarGhee spread is dubbed ‘integral’. By mixing in fresh, chopped parsley, another eminent herb, the numerous beneficial effects of which many have not yet been realized, is added. Persian scholar Avicenna believed that parsley stimulates urine output, regulates menstruation, and cleanses kidneys, bladder and uterus. Ancient Romans fed parsley to gladiators as it supposedly provides power and better responsiveness. This light green herb improves the taste of many dishes. As for its nutritional value, parsley ranks among the top foods, especially when eaten raw. Raw parsley consumption is an easy way to increase iron, calcium and folic acid input as well as to satisfy the daily need for vitamin C.
The third and elementary ingredient in the spread is the 48-hour-cookedGolden Ghee (gi) or genuine butter. Ghee is a splendid medium as it binds tastes, increases absorption and efficiency of ingredients, and above all, enables the transfer of all the afore mentioned and beneficial components into the body. It is considered culinary gold and is classified among the best of oils. Due to its beneficial effects and universal applicability it has been extolled in Ayurvedic medicine for millennia, and for many represents the pillar of quality cuisine and ‘la Chef’ secret. GarGhee is thus a complete and indispensable spread. 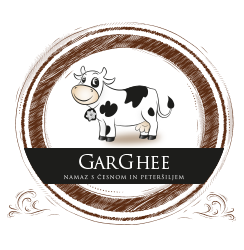 It is known for its invigorating taste, is easily spread and made from entirely natural ingredients. It can be consumed independently, with a slice of bread or as an excellent addition to sandwiches, salads, sauces, pasta and other ready dishes, especially Mediterranean. "Flora, fauna, Earth and people." 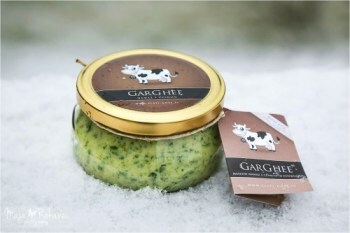 GarGhee ECO butter spread with garlic and parsley. 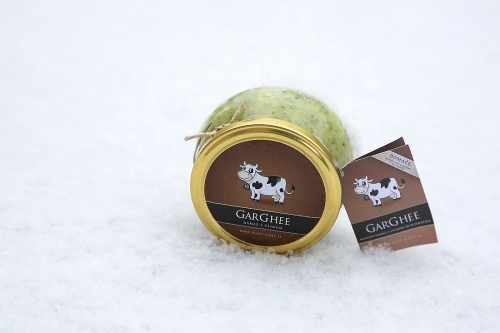 Ingredients: rendered butter Golden Ghee (53%), chopped garlic (30%), chopped parsley (15%), herbal salt*: marjoram, savory, basilica, celery, lovage. After opening store in refrigerator. Can be left out for 3 days. Easiness of spreading is the key to full taste.